Chanteur US né Charles Nelson Miller, le 30 Août 1924 à Wellington (Kansas). 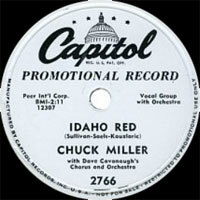 Chuck Miller est décédé le 15 Janvier 2000. US singer born Charles Nelson Miller August 30th, 1924 in Wellington (Kansas). 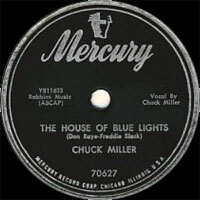 Miller was a boogie-woogie piano player who had a 1955 Top 10 single with ‘The House Of Blue Lights’, a rocking version of an Andrews Sisters song that had previously been a hit in 1946 for its co-author, Frank Slack. 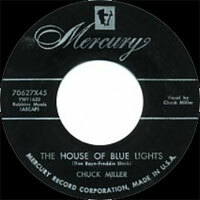 Recorded for Mercury Records, the cover version was Miller’s only major hit. 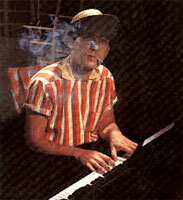 Prior to his biggest recording, Miller had recorded some tracks for Capitol Records and, following the US number 9 hit, he continued to try for others, with no luck. 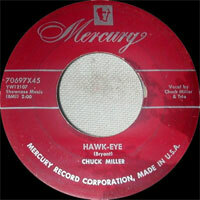 His only other chart record was ‘The Auctioneer’, a country song that reached number 59 later in 1956. 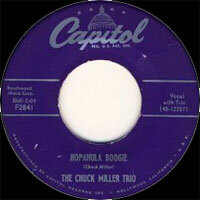 Chuck Miller died January 15, 2000. 12/1948 78 t. Meadowlark ? (US) .